Located on the beautiful Galt Ocean Drive, South Point is directly on the Atlantic Ocean's golden shores. The 400 apartment units range from spacious 1 bedroom to 3 bedrooms, ranging in room size from 1,200 to 3,100 square feet. All apartments have their own washer and dryer, an ocean view, and indoor garage parking. Among the many amenities at South Point are 4 state of the art fitness centers, 2 tennis courts, 2 shuffleboard courts, bocci court, 4 card rooms, 2 spacious lounges, 2 billiard rooms, and a sparkling large heated swimming pool. 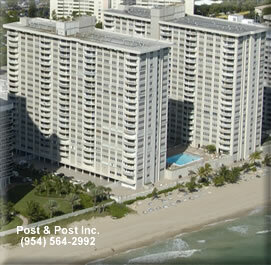 Residents are just steps away from our 400 foot broad beach and can have a cabana on the beach. We are proud of our Security Force and are the only building on the Galt Mile that maintains a guard in front of the building 24 hours a day.